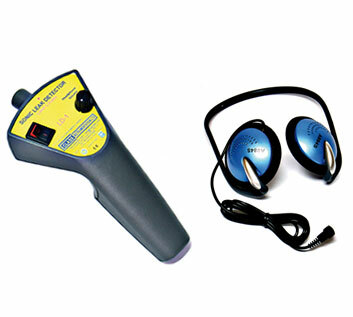 A sonic leak detector uses ultrasonic waves to detect leaks in a system. The way this type of detector works is pretty similar to how a radar works i.e. the device emits ultrasonic frequencies that bounce off the surface of a pipeline, the sensors on the detector then measure the waves bouncing back in order to find out if there is a leak. In case of a leak the number of sonic waves being received by the detector will fall dramatically hence indicating that that specific location has a leak. This makes it easier for engineers to find and remove leaks from a system of pipelines. Sonic detectors are used to find leaks in water pipes. Oil and gas pipeline engineers regularly use sonic leak detectors to find leaks. Residential and commercial contractors often use a sonic leak detector to find leaks in homes and office buildings. Why buy a sonic leak detector? A sonic leak detector is an easy to use device which in most cases can be carried around in your pocket. The device works by emitting a series of sonic waves which help the device pinpoint a leak in the system. Many of the latest sonic detectors require no formal training to use and can even be used by home owners themselves to find leaks in their bathrooms, kitchens and sewage lines. The other good thing about this type of detector is that it is easy to find both online and in offline stores. In addition their excellent accuracy makes them a tool of choice for many professionals. How much does a sonic leak detector cost? The cost of a sonic leak detector will mainly depend upon who the manufacturer is as well as what functions it has. There are many sonic leak detectors which are designed to enable them to detect both gas and liquid leaks, but these detectors are often more expensive than single function detectors. If you want to purchase a detector to be used around the home you may want to pay the extra amount for something which is used as a multi-purpose detection tool. In most cases you shouldn’t have to pay more than $1000 for a sonic detector. Since many of these detectors are solid with a money back guarantee you can always return the detector if it does not work or gets spoilt for some reason. Does the sonic leak detector interfere with animals and other electronics? This is a very common question especially by pet owners who want to use a sonic detector around the house. However, unlike what many people think both animals and electronic items are not affected by a sonic detector since the frequency it uses is far higher than what dogs can hear and it does not affect electronics since it works at a totally different frequency range. But if you are still in doubt you can always borrow a detector and use it around the house in order to get comfortable with it.